ambia’s contemporary culture is a blend of values, norms, material and spiritual traditions of more than 70 ethnically diverse people. Most of the tribes of Zambia moved into the area in a series of migratory waves a few centuries ago. They grew in numbers and many travelled in search of establishing new kingdoms, farming land and pastures. Dance is an important part of musical expression among Africans and along with the ideas they express, serve as reflectors of life and thought over the centuries - of times of turmoil and peace, tension and confidence, retreat and advance, conquest and defeat. The influence of the west and the rest of Africa is well entrenched in music tastes of the current generation in Zambia. In the big towns, night clubs and shebeens belt the sounds of Kwela and rumba and many local bands play to the increasingly westernised youth. The economy of most of the crafts people is based on fishing, cattle or the cultivation of crops. Craftwork is often done seasonally to supplement the incomes of many families. It was originally intended for barter and made according to the needs of other villagers. To many, especially the subsistence farmers, craftwork is their only means of earning cash. Traditionally made pots and baskets in the more populated areas however, are being replaced by commercially manufactured utility items made of plastic or tin. A large part of the new generation are losing these traditional skills because of a lessening demand and others have begun to make more modern items like lampshades, shopping and laundry baskets and furniture. Fortunately there are organisations such as Zintu Handicrafts in Lusaka, the Nayuma Museum in Mongu, the Tonga Museum in Choma and the Moto Moto Museum in Mbala, which aim to stimulate the production of quality craftwork both in traditional forms and where craftwork is a contemporary expression of art. Basketry, practised by both the men and the women is widespread. The many forms and raw materials used reflect the environment in which they are made: bamboo, liana vines, roots, reeds, grasses, rushes, papyrus palm leaves, bark and sisal. They are decorated with symbolic designs using traditional dyes made from different coloured soils, roots, bark and leaves. The variety of uses for basketry is wide; carrying and storage, fishing traps, beer strainers, flour sieves, sleeping and eating mats and a variety of tableware. 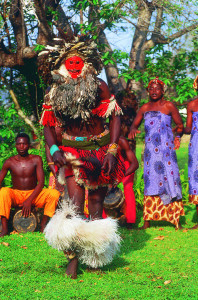 The Lozi and Mbunda people in the Western Province are particularly skilled in this field. It is the men that usually do the woodwork and carving and produce canoes, furniture, walking sticks, utensils and food bowls as well as masks, drums and a variety of animal forms. The potters are usually, though not always women who work the clay and then fire them on open fires or pits. The principle urban centres, Lusaka, Livingstone and the towns on the Copperbelt are where most of the rural people head when they make the decision to leave their villages. The transition may not be an easy one, especially as the motivation is to find work and very often they are disappointed. The impact on the cities has been immense. A ring of shanty towns around the peripheries, with no electricity or adequate sanitation increases both disease and crime. But the shanties are filled with a people who have made a fine art out of surviving with very little. Home industries spring up everywhere from tailors, cobblers, vegetable sellers, money exchangers, to hundreds of walking salesmen selling anything from frying pans, electric plugs and batteries to fruit, vegetables and nuts. The unemployment figure is currently about 60%. But despite the dirt and discomfort of the city, the allure is still powerful. The countryside may be healthier, more open and free, but to many of the rural young, it is monotonous compared with the action and energy of the big city. The massive markets that have developed are a world within a world in the cities. Thousands of little wooden stalls crammed together selling a wide variety of goods in an endless shanty shopping mall. The mood in the markets is very lively, serving as a social meeting place as well. The impact on rural villages will have long term detrimental effects as it is mostly young men under 25 that leave, leaving the women folk to raise children, tend to the fields and eke out a living by themselves, since little money is made in the cities so little is ever sent back. Fewer traditional farmers are making a living by agriculture and crop output for the nation is reducing as a consequence. Zambia faces an enormous challenge to cope with this trend, not only to lure people back to the country to cultivate the land, but to ensure the people who won’t leave the cities, are gainfully employed. There is also a burgeoning well educated middle and wealthy class, white collar workers and entrepreneurs. Many women are in management positions or have their own companies and several are in government. Africa’s economy, before Europeans arrived was essentially a rural one. Fishing, hunting and agriculture were the means of survival and because numbers were small, these activities were viable. With the increase in community sizes and the lure of the cities, rural life has undergone fundamental changes. Most villages are dominated by women who now have to depend on their own ingenuity to generate cash to support their many children and very often their elders. Adulthood comes at an early age to rural children, especially the girls. Few manage to start school before ten and only five years later they are considered adults with all the attendant responsibilities of marriage, child rearing and tending to crops. Only a small percentage of children finish primary school due to the high cost of uniforms, books and various school funds which parents must contribute. Usually a woman will have between 6 and 12 children and the cost of schooling for all of them is usually out of their reach. The desire to have many children still remains, even with the attendant hardships. The idea of long term insurance overwhelms the sacrifices. Different tribes have differing village styles, some build their houses from mud and thatch, others burn bricks and build square houses which they paint with individual patterns. Usually long distances must be walked to fetch water and wood for fuel. But although life is hard in these remote villages, they are by no means unhappy. Pleasure is taken in simple things and problems are shared. Daily chores are done in groups and often become social occasions. Everyone contributes to weddings and funerals otherwise they would not be affordable. There are no invitations and anybody in the village is welcome to join in. Many of the tribal customs are only still practised in the rural areas as the urbanised youth aspire to Western behaviour. Funerals are also big occasions in the villages. Everyone clubs together to help pay the expenses. Grief is shown through wailing singing and dancing and becomes quite an emotional affair. During the mourning period women and men separate, the men staying outside and the women in the house of the deceased. After long speeches about the departed friend and thanks for the donations, the whole village walks to the place of burial to pay their last respects. The government has a policy of universal free primary education and health care. Health facilities however are grossly inadequate with only half the required doctors needed to service the population. Some 95% of primary school age children are enrolled at schools with 20% continuing to secondary level and 2% of the 20 - 24 age group in tertiary level. Illiteracy is only 27% but the drop out rate at schools is very high. In rural areas, the standard of education is hampered by lack of facilities, transport and teachers.